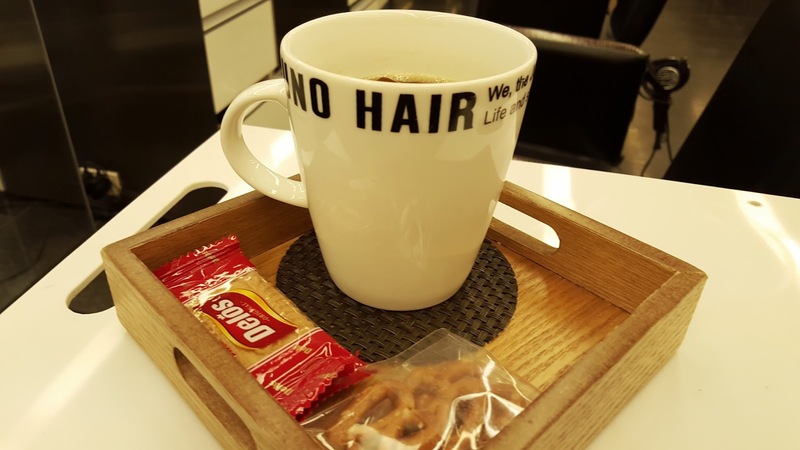 Enjoy this vlogging hair adventure and afternoon in Myeongdong–Seoul, South Korea. Fall is in the air and time for some changes. I love a good balayage so I booked an appointment with my stylist at Juno Hair 2 in Myeongdong. I’ve been going to her for about 8 years now and love her. She knows my hair and knows what it can handle, how to cut it, and what styles work. I believe you should stick to one hair stylist (and colorist, they don’t always need to be the same person) who can get to know your hair. I’ve heard time and again of people experiencing bad cuts because they can’t book with their regular stylist and settle for someone else. Don’t do that! 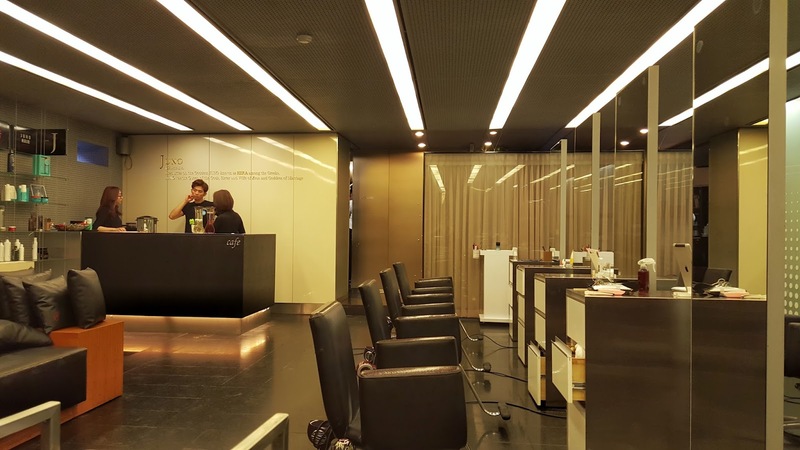 Anyway, let’s peek into a Korean beauty salon, shall we? 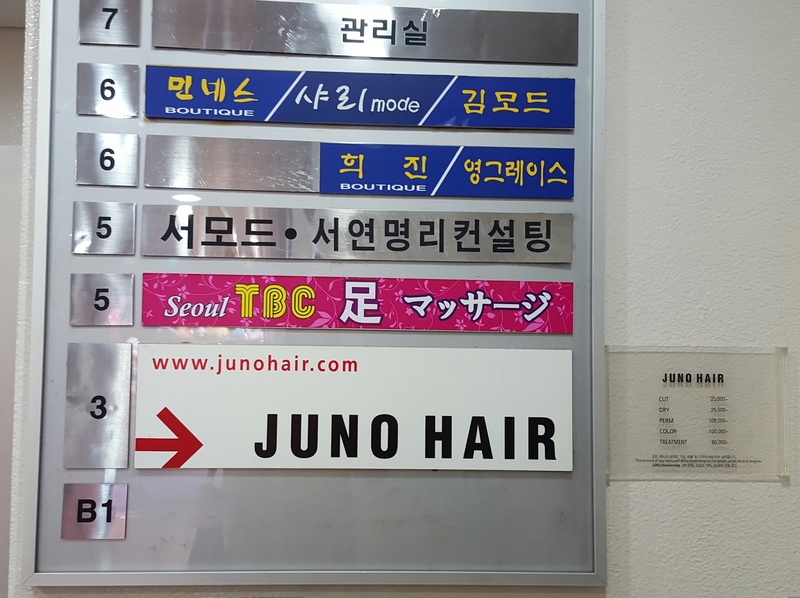 I’m speaking about Juno Hair, a popular chain hair salon found all over Korea. 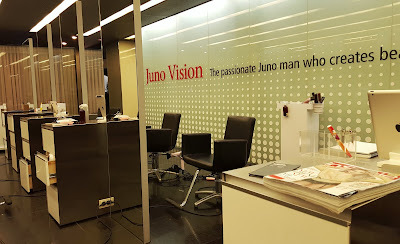 Upon entering Juno you will be greeted by the front desk receptionists. Give them your name, what you need done, and if you have an appointment. Now is the time to find out how much your services will cost so there are no surprises (I’ll put some pricing below). Then someone will take your coat and bags, and a key to your personal locker. Your stuff will stay secure while you have your hair done. Usually you’ll head upstairs where you’ll have a chance to get something to drink while you wait. I love this part! Free drinks and snacks. They do have an espresso machine so I opt for an Americano and snacks. Enjoy this either while you wait or during your service. Usually there will be more than one person helping you. Your stylist has assistants that are learning along the way. They will usually shampoo/dry your hair while your stylist is working with other clients. At times you might have two people blowing your hair dry at once. That is totally normal. Dry cuts are a thing here, too, and I much prefer it (cut before color or shampoo for a cleaner/better result). **One thing to note regarding this arrangement: if the stylist is with another client, and your assistant starts doing something that you want your stylist to do, speak up! Don’t worry about offending anyone, it is your hair so you have every right to say who is cutting or coloring it. I always make sure it is my stylist doing my cut and color (not the assistant). I booked with my stylist, so that’s who I want fixing my hair. My absolute favorite part of the whole experience? Getting my hair washed! I love it when someone shampoos my hair (you know that’s your guilty pleasure, too!). Plus they throw in a rocking scalp/neck massage while the conditioner works its magic. Love that! Note, another assistant will wash your hair. Shampooing station is behind those curtains. Go in the morning when it isn’t busy. So relaxing. 1. Don’t go on Saturday (and never get a color on Saturday!). Most places are super busy and you will feel rushed. Trust me. Book an after work appointment during the week. Most salons are open late. My favorite time is weekday mornings as there is no one around. 2. Bring in a picture or YouTube video. This is the best way to help express what you want if your Korean abilities are sub-par. That and body language. If you have a friend or co-teacher on standby, that helps, too. 3. If you are blonde (or will color with bleach) do it at your own risk. Because Western hair is such a different texture than Korean hair, bleach is stronger and they often don’t have the correct toners to keep the brass at bay. Some stylists aren’t experienced with it and can burn your hair off. Take heed. Find a salon that can meet those needs. I’m lucky that Do (sounds like “dough”, my stylist) knows my hair after all these years, but it was a learning process. I don’t know the bleach/toners she uses. Also if you previously dyed your hair and the color is still there tell the stylist. I’ve heard of experiences where the different chemicals react and cause color problems. 4. First time with a stylist? Don’t go crazy! Take the first appointment to get a trim, simple cut and see if you like the results. If not, try someplace else. If you love it, then go for something more drastic the next time. Test the waters before jumping in. My stylist Do. She has a great team there. I’ve always had awesome luck with Juno Hair. I have been to branches both in Bundang (Sunae Station straight out exit 2; ask for Nikki, she speaks English well and is super nice) and Myeongdong (Juno Hair 2 ask for Do “dough”, she doesn’t speak much English but her staff is great and she has skills). I’ll link maps below. There are multiple Juno Hair salons in most districts, so keep your eyes peeled. Also, ask for an English speaking stylist as most places have a few people on hand that have trained abroad. 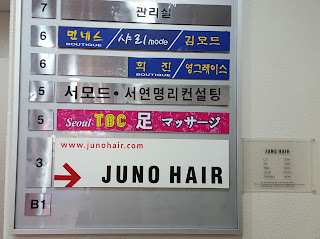 Juno Hair 2: Myeongdong Station, Exit 6. 3rd Floor. 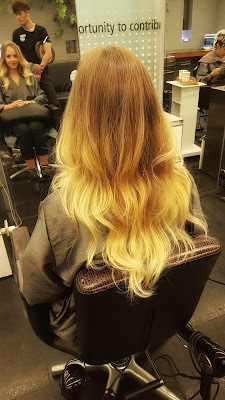 I went to Sarah at the Juno in Sunae and I can't recommend her enough for blondes with thin, long hair! She gave me great dimension with highlights and low lights and did a perfect 'long sweeping layers' cut. 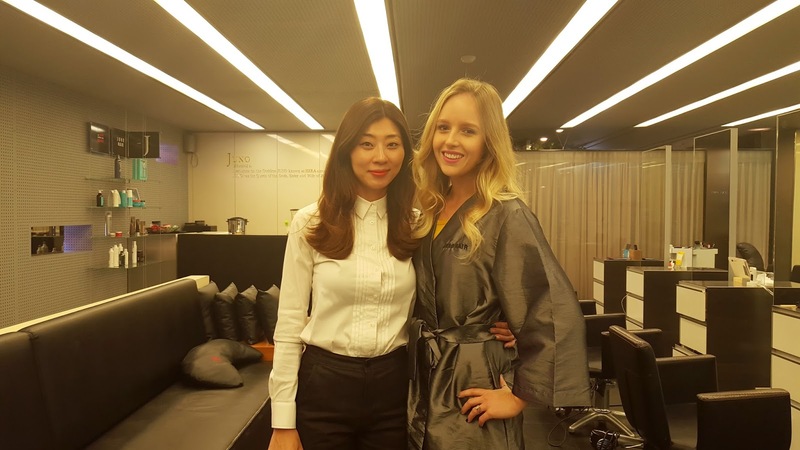 She worked in New York for years and speaks perfect English so if anyone in the Bundang area is hesitant about going to a Korean stylist, I highly recommend her! Hi, how did you book your appointment? 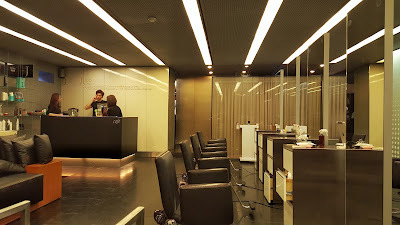 I went in and got a nice haircut for ₩27,000. They made me sign up for the membership, but I failed to ask if I have to pay a monthly fee or whatnot for the membership. Do you know if membership is free or there’s a fee?